It's high school musical season again. Have you ever seen Guys and Dolls? I like the unusual plot line: it's one of the few dramas in which a Christian is redeemed by someone she's trying to save. When we first meet Sgt. Sarah Brown of the Save-A-Soul Mission, she is followed by a noisy band. Remember how St Paul says that, when we speak without love, we sound like a resounding gong or clanging cymbal? That's a fitting description of Sgt. Sarah Brown. I have to wonder if her annoying band is supposed to be a nod to St Paul's gong-and-cymbal comments. Her speeches are well-meant but completely loveless. There's not a lot of mercy in them. She's shocked and disappointed that nobody listens. Sky Masterson's interest in Sarah Brown is in order to win a bet: he has to get Sarah Brown to agree to go to Havana, with its decadent night life. In her desperation to appear successful to her religious leader, she agrees to go to Havana with him in return for his promise to bring people to the mission where her supervisor can see. * In Cuba, Sky's skillful scheming seems to pay off. He even gets her drunk without her realizing what she's drinking. In a surprise twist, Sarah Brown begins throwing herself at Sky, and having fun for the first time in her life -- but he can't bring himself to take advantage of her. After they get back to the states, Sky even claims to have lost the bet that he could get her to go to Cuba in the first place. When Sarah finds out that Sky has lied -- and put out word that he has failed -- to save her reputation, she has something close to a religious experience herself. She now knows what it's like to need mercy, and to be shown mercy. For the first time, she has some sympathy with people who have not lived blameless lives. She even finds herself talking to one Miss Adelaide -- a stripper -- as just another human being like her, a feat that would have been impossible in her former days as a cold and arrogant person who assumed her own superiority. So from Sarah Brown's point of view, Guys and Dolls is the story of how a "sinner" saves a "saint". * When they get to Cuba, the Sky-and-Sarah story has all the makings of a Faust story. She's sold her soul to gain the appearance of religious success in the eyes of her supervisor. The surprise in this story is that the devil repents. "Sky Masterson" -- symbolic name much? These thoughts are in the style of how the ancients pondered over Scripture in the Talmud. After Jesus had been in the wilderness, we read that the tempter left and that the angel of the Lord came. Why did the tempter leave Jesus? Because the tempter went in search of someone who would yield to sin, as it is written, "Evil pursues sinners," (that is, not the righteous). Proverbs 13:21. And why did the angels come? The fear of hell has gained an unBiblical place in some discussions about Jesus. How can we tell if hell has been pushed to the front too far? We can compare it to the place it has in the gospels. Doing a quick verse search of the four gospels (AV), I found the words "hell, condemn, perdition" 25 times in the gospels* -- and the words "heaven, forgive, save" 209 times. So if someone wants a truly Biblical gospel approach, heaven should get far more time than hell -- and Jesus more time than either of those. 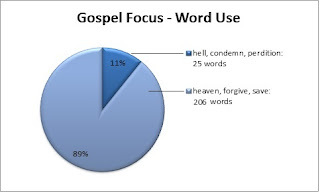 I'm not saying you have to count words; but I am saying if the focus leans towards hell, then the priorities of the gospels have been turned upside down. Is 50/50 -- equal time -- unbalanced? Yes, 50/50 is unbalanced when the original source material is closer to 90/10, in the nearest round numbers. Here's an example: do you remember how microscopes and magnifying glasses work? They enlarge things, and they measure how much magnification something gets. To get a 50/50 presentation here, you'd have to place a nearly 5x magnification on hell -- and in the same way you'd have to reduce the place of heaven to get it down to only 50%. Jesus did not preach, "Repent, or you'll go to hell." He did not preach, "You're going to hell; repent so you go to heaven." He preached, "Repent, for the kingdom of heaven is at hand." Then he spent a lot of time teaching what that kingdom of heaven is like. Preaching the good news does not need to be without any mention of hell -- but too many people preach a message where heaven is overshadowed by hell. That approach has it backwards. The gospel is that, in Jesus, the kingdom of heaven is at hand. * Yes, "perdition" was actually used in that old translation, which is why I searched for it. Towards the end of this post I've put more detailed thoughts -- which were written first but are lengthy. Not everyone will care to read that much detail. But here I did want to offer possibilities of how to explain Jesus' way better in ways that are quick and to the point. Different roads lead to different places. If the path you are on does not lead to reunion with God, then you are lost, and the happiness and fulfillment you find apart from that will not last. If people are not following Jesus, they are not on the road to where Jesus is. The other spiritual leaders of past ages are in their graves; Jesus rose from the dead. See for yourself whether all paths lead to the same place. There is no such thing as a great truth that it is good to ignore. There is no such thing as a great philosophy that avoids great truth. There is no such thing as a great spirituality that ignores Jesus. If we strive for right speech then we avoid wrong speech. If we strive for right action then we avoid wrong action. If we strive for the right road then we avoid the wrong road, and those on the wrong road are lost. More detailed thoughts are below. For those who stop here: Let me know how you'd respond. I should mention from the outset that I haven't verified whether the quote actually comes from the Dalai Lama. The first step in looking at this quote is to see it for what it is, and how it fits in the existing conversation between people of different faiths. The words chosen about "different roads" and "lost" suggest that he's thinking about Christianity and Jesus. Even if he firmly believes that the same applies to all faiths, still the words seem specifically selected to address Christianity first and foremost. In particular, the wording seems to be chosen to disagree with Jesus' call "Follow me", his claim of being "the way, the truth, the light" -- that "nobody comes to the Father but through me", and how he has come to seek and save the "lost". If this is the intended meaning, then the quote is a claim that Jesus' teaching is false or meaningless. The original quote above seems intended as a rebuke to any Christian who would stand by Jesus' claims to uniqueness, and to evaluate Jesus' claims not in terms of truth or goodness, but in terms of whether someone could find a way to be happy somewhere else. Look at how the goal of life is portrayed in that saying: "seeking fulfillment and happiness." It speaks of fulfillment and happiness as if they are goals in themselves, and that they might be attained in any number of ways. It implies that our own feelings of fulfillment and happiness are the goal of our spiritual path; there is no recognition of God, no recognition that fellowship with God, reunion with God, reconciliation with our neighbors -- that these have a necessary and unmovable part in the kind of "fulfillment and happiness" that is meaningful and lasting. Look at how the idea of "one true path" is portrayed in that saying. The way of following Jesus is not here portrayed as Jesus himself, but as "your road" -- a private thing, not something belonging to the whole world or all of creation. The saying is meant to claim the equal validity of all paths -- and to characterize those who say there is one path as narrow, arrogant, and prideful. It seems meant to silence those who teach that Jesus really is the Messiah, the world-wide ruler ordained by God the Father to bring peace to the nations. In silencing and ignoring Jesus, it silences and ignores the hope he brings. I'm sure the reader will have noticed that the original saying does not recognize or acknowledge God's existence, and turns all spirituality into a private matter without basis in reality. The only measure that it recognizes is human emotion, specifically "fulfillment and happiness". I've mentioned before in some detail ways in which Jesus is unique, from the unmatched power and beauty of his teachings, to his credible knowledge of the end of all things, to his resurrection from the dead. So I will not trouble myself too much right here with explaining again all the ways in which Jesus is unique. It is important for us to know how to answer when people claim that Jesus' uniqueness is a private or personal opinion rather than a demonstrated and beautiful truth. The question here is: Once we have seen Jesus' uniqueness, can we explain it to other people in such a way that their minds will be open to hearing? The appeal to "different paths" often means "my mind is closed to Jesus." Jesus' greatness is apparent to those who read the accounts of his life. Jesus' greatness is seen as a threat by those who would like a Jesus-free spirituality. But how do you justify avoiding something despite its greatness? It can't be done; it is clearly narrow-minded, shallow, and petty. Still there are some who want a way to ignore Jesus or make him irrelevant. The simplest way to do that is to characterize the people proclaiming his greatness as intrusive meddlers who are themselves the petty and narrow-minded ones. Can we find a way to explain so that other people will be open to hearing? In some cases that will depend on the hearer; some people, in taking up a saying like that quoted above, intend only to get rid of Jesus from their religion, to stake a claim that a Jesus-free spirituality is just as valid as following Jesus. So the above are my thoughts on how we might explain our thoughts, and how we may correct how our thoughts are mischaracterized by that original saying. So what would you say in response? Over time, a church's teachings grow. I'm not talking about the space of mere years, but the course of centuries. Every once in awhile, though, as the church keeps adding to its teachings, the old doctrines and the newer ones don't blend well. I'll start by picking on my own group: Lutherans. Originally Lutherans were a plain-spoken people, taking straightforward approaches to Scriptures, and being open about the fact that the early church held some Scriptures in higher regard than others. There were books in the Bible that the early church accepted from the beginning, and others that were only accepted gradually or reluctantly. Lutherans had no problem saying that the books of Hebrews, James, Jude, and Revelation "had a different reputation" in the early church, in ancient times -- a more uncertain reputation, to be exact, than the well-accepted books such as the gospels, or most of the letters in the New Testament. To this day a well-trained Lutheran theologian will handle some books of the Bible with more caution than others out of respect to the earliest church's different opinions of them. Over the long years the idea of "attested by the early church" was assumed and was no longer the central focus; "inspiration" started to gain in importance. Is Scripture inspired? Does inspiration have levels? Does "inspiration" allow for treating books differently depending on whether or not the early Christians received them? If all the books are "inspired" in the same way, on the same level, then does that leave any room to say "no doctrines are based on the books that the early church did not receive from the beginning"? How can a book of the Bible be "inspired" (and possibly inerrant, according to some groups) -- but not suitable for forming doctrines? I've noticed that some other groups have "Catch 22" scenarios in their teachings, areas where there is tension (to say the least) between different teachings. If any fellow-Lutherans read the blog -- what do you think? For the non-Lutherans out there -- have you seen any "Catch-22" doctrines around? The religion *of* Jesus, or the one *about* him? Anyone can make a claim; the question is how well a claim holds together when it is examined. Rational people will test claims to decide on their beliefs. So this set of claims about Jesus leads us to look at what we know about Jesus, and see what he taught. There is little argument whether Jesus taught about love, mercy, compassion for the poor, and the kingdom of God. The question is whether he also saw himself as having any special role in all that. Where do we turn to learn about Jesus? Skeptics of Christianity might be inclined to turn to the alternative gospels outside of the Bible -- but in the alternative writings Jesus can be almost otherworldly maybe not even truly human. In some of the alternative gospels Jesus is no longer even identified as "Jesus" -- he is instead "the Savior". If a skeptic sets out on a quest to find a version of Jesus who fits that secular narrative, someone who was just a spiritual guy that was misunderstood after his death, the alternative gospels will not help him to find that. Historians often take the view that the closer we are to the source, the better the material. And most scholars of early Christianity consider the Gospel of Mark to be the earliest record we have of Jesus' life. So that will be our source here. Some scholars consider the Gospel of Mark to be earlier than the fall of Jerusalem in the year 70 A.D.; others place it barely later than the fall of Jerusalem. Either way, that is within the lifetimes of many who had known Jesus in person. So the Gospel of Mark is early enough that we should be able to get fairly reliable information from it. If we limit ourselves to the Gospel of Mark as the earliest source, what does Jesus say about himself there? The "power to forgive sins" struck the religious authorities as out of bounds; the accusation of "blasphemy" comes up here for the first time in Mark's narrative. ("Blasphemy" was a religious crime which, back then, carried the death penalty.) "Lord of the Sabbath" was probably a surprise to them. The part about giving his life as a ransom again sounds as if he thought he had some sort of special mission. Some of the material he taught about himself is embedded in parables or prophetic statements. Here are two different sayings where, at face value, they sure look like Jesus is making unique claims for himself -- about how his relation to God is different than any other messenger, and why he is in the world, and his role in building the future. More than once, we see Jesus himself pressing the issue of who he is, directly bringing that question to the front of the conversation. Jesus is the one who challenged the religious leaders about whether the Christ or the Messiah was merely King David's descendant. Jesus quotes the Psalms speaking about the Messiah, "The LORD said to my Lord, sit at my right hand til I make your enemies your footstool," placing the Messiah as the one sitting at God's right hand. (Mark 12:35-57) He then challenges the religious leaders on how the Messiah could be merely David's descendant, when David spoke of him like that. In these cases, Jesus is the one raising the question about who he is and what it means to be the Messiah. The Gospel of Mark records that this answer was considered blasphemy, and played a direct role in Jesus being sentenced to death. * As has often been mentioned about the "revised Jesus" who was merely misunderstood -- it's difficult to see why anyone would have had him executed. Many of the skeptics of Christianity might concede that Jesus was a prophet. The atheists might concede this because they don't believe in God, and a "prophet" is at best a guy who is spiritual. Others could call Jesus a prophet on the grounds that there are plenty of prophets and so someone could call Jesus a "prophet" and still maintain that Jesus has no unique place in our understanding of God. Here Jesus claims kinship with anyone who does the right thing -- as Jesus says, the will of God. If Jesus is in the brotherhood of man, surely he's one of us. However, whether he is one of us is something that both sides agree on. The question is whether he saw himself as having a unique place, such as Messiah. I don't understand what course of open research would cause a person to consider what Jesus said about "prophet" but not see "Messiah" and "right hand of the LORD" and "authority to forgive sins". I don't understand what course of open research would cause a person to consider Jesus as brother to all who do God's will, but not see him challenging his disciples to think about who he is, and challenging the religious teachers about Messiah's place in the big scheme of things. It seems that someone would have to pick through the Gospel of Mark very selectively to miss the times when Jesus claims a one-of-a-kind role in the history of the world and in our relationship with God. I know, all the things that Jesus said about himself have come under challenge as to whether they are "authentic" sayings. Even the high priest's declaration of blasphemy and tearing his robes in response has been challenged as to whether it is "authentic." But "authentic" seems to be judged by the criterion of whether it fits with the secular orthodoxy that insists that Jesus couldn't possibly have said that because Jesus must have been misunderstood, or have had his sayings embellished, or anything that would mean he never actually said such a thing. That is to say, the challenge seems to be based on secular dogmas, which raises the question: is the criterion a closed mind that won't give a fair hearing to the alternatives? Or is there some sort of actual historical reason to doubt that Jesus said these things? If Jesus did say these things, it would explain how the religion came to be about Jesus so very early in its history. And so there, in the earliest gospel, we find Jesus challenging his disciples about who he is -- where we find he sees himself as the Messiah. We find Jesus challenging the religious authorities about whether the Messiah is more than they realized. What we don't see is just a guy who was misunderstood about whether he really thought he was unique. Here I've made no argument about whether anyone should agree that Jesus is the Messiah, or agree that the Messiah is at God's right hand, or agree that Jesus is unique in all of history. But the earliest records we have say that he claimed it about himself. * To us, the "clouds of heaven" part might seem overdone. But it's not the only time he referred to himself as coming on the clouds; elsewhere he said that the people would see "the Son of Man coming on the clouds with great power and glory" (Mark 13:26). Most Christians have already heard the basic things the Bible teaches about the Sabbath. The Sabbath was given to Israel as a day of rest. Jesus healed on the Sabbath; some objected that he was a Sabbath-breaker. He explained the good of his actions, showing from their own Jewish tradition how the Sabbath did not stop someone from doing a greater good: they would circumcise a child into the covenant on the eighth day even if it fell on the Sabbath; the priests would serve in the Temple on the Sabbath; someone could rescue an animal that had fallen into a pit on the Sabbath day. He said the Son of Man was Lord of the Sabbath. After Jesus' ascension the early church leaders met to discuss which of the ancient Jewish laws applied in the church among the Gentiles, and the Sabbath was not mentioned. In the New Testament letters, we are told not to let anyone judge us about the Sabbath day. Paul wrote that some people valued all days equally, and some held one day above another -- that each of us should be fully convinced in his own mind, but that we should not judge each other or cause someone to trip up over these things. If it was made for us, we are permitted to enjoy its blessings, keeping in mind: the Sabbath is not Lord over us us; Jesus is Lord of the Sabbath. Somewhere I read that in ancient times a pagan had criticized the Jews over the Sabbath, saying they were lazy to keep the Sabbath because a Sabbath would leave the work un-done. The Jewish response was: the command says "In six days you shall do all your work" and on the seventh rest -- so that the whole command was kept not only in the one day of rest, but also in the six days of completing all the work so that it was possible to take a day of rest without neglecting important things. The Sabbath was given as a memory of God resting from his work, and also as it says in memory of Israel's rescue from slavery. So the Sabbath is a lasting memorial of a rescue from slavery. In our age it can be a reminder not to become enslaved willingly. Some types of people become over-committed, and we risk becoming slaves to ourselves, never having a day of rest. Once in war-time the staff of an aluminum plant worked seven-day weeks. At the end of the war, when they first scaled back to six-day weeks, the plant produced more per week in the six-day weeks than it had in the seven-day weeks. I have this on the word of one of the plant managers, who was my grandfather. Again, I read somewhere that while people do produce more if they have a day of rest, that we must not imagine that is the true purpose of keeping a Sabbath: as if the true purpose of man were to be productive workers, and the Sabbath was meant to serve our productivity. Instead, the Sabbath is kept as a blessing in itself, not for the sake of something else. It's likely that the things I've remembered reading, as mentioned in this post, can be found either in the text or footnotes for A.J. Heschel's The Sabbath. I would give that book mixed reviews, but it was well worth the read. At the beginning of Jesus' public ministry, his first action after his baptism was to go to the wilderness for a time of fasting. How did he spend the forty days? Did he spend the time fixing his mind on the things he needed to accomplish? Did he fix his mind on the good he was setting out to achieve? Did he picture the ultimate success of his achievement in the world to come? We only know this: a tempter came with these temptations: Prove yourself. Use your abilities and powers to serve yourself -- it's not much, and nobody could dispute that you need it. Use God's favor and protection to glorify yourself. Gain the world for yourself. Jesus said no. We say yes, too often. Those same temptations come to everyone who sets out on any major task. Those temptations come even to people who set out to achieve something good -- maybe especially to people who set out to achieve something good. We think if our goals are good then we have already gotten past the temptations. We're wrong about that. The temptations are right with us: Prove yourself. Make it about your own reputation. Use some of your status for your own benefit. Gain recognition and honor. Gain something for yourself -- after all, you've deserved it, haven't you? Aren't we supposed to be gaining something? We begin follow Jesus at our baptism -- he is baptized, and we follow him in our own baptism. We can forget to follow him for the next step: rejecting the temptations that came even to him. Those who serve are tempted to make it about themselves. People need to be convinced their leaders are clever, right? The leaders, once they begin to lead, need to prove themselves, don't they? It helps the ministry if we gain recognition, doesn't it? At each turn, there's a wrong way to do things, which leaves the ministry subtly poisoned -- or not so subtly, as time goes on. I wonder how much every human action meets those same temptations. I wonder how often we recognize them. Our seminaries teach people how to read Greek and Hebrew, how to interpret the Bible, how to preach. But none of that can make someone a good pastor. They teach systematic theology, Christian doctrine, church history -- but those don't make a good pastor either. If a pastor doesn't love Jesus, then whatever he's doing, he's not "feeding the sheep"; they will go home unsatisfied. They may go home educated, or motivated, or impressed; but they will not be spiritually fed. The gospels teach us to love Jesus. The authors wrote them because they had learned to love Jesus. What makes people want to follow Jesus? It's not being impressed with the pastor's skill in translating, or in skewering his enemies, or in presenting himself as smart. It's not even understanding systematic theology. It's Jesus. When we see and recognize the good in him, we follow him. Yes, I'm aware that haiku is not usually used with other poetic devices. But, really, it's fun to mix and match.